Dear students, as Quantitative Aptitude is an essential part of IBPS examinations, many of you must be anxious about attempting this section during the examination. The level of every other section is only getting complex and convoluted, no doubt this section too can make one's blood run cold. As per the analysis of previous examinations, the questions asked in this section are calculative and very time-consuming. Data Interpretation and topics from arithmetic section make it hard for one to deal with the section as easily as any other section. But you should not forget that a mix of accuracy and a good number of attempts can definitely turn the situation round in Quantitative Aptitude Section. 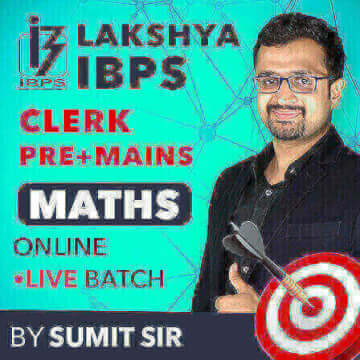 And to ease your way to ace the grades in this section, Adda247 brings to you a special online batch "Lakshya IBPS Clerk Pre+Mains Live Batch By Sumit Sir". Earlier only 200 seats were available for the batch but a huge number of students made a request to increase the number of seats and now we have increased the number to 250. All the students who have doubts in certain topics of this subjects, they are not even able to clear the concepts on their own and want to join coaching classes for the same. This Online Batch is specially brought up for those who are not able to join classroom programs due to certain reasons. Also, a huge number of students apply and appear for these examinations every year and that's the reason why the fight to get through these examinations is real tough. It's like shape up or ship out, so students, start off your preparations right away. And all that one needs to make the cut is a proper guidance in order to take steps in the right direction. The online batch starts on 25th of September 2018 (Time: 10:30 P.M. - 11:30 P.M.). The classes will run on 5 weekdays (Mon-Fri) for an hour for Quantitative Aptitude Section of IBPS Clerk Prelim and Mains Examinations. There are a total of 250 seats for the batch and the candidate is required to have the minimum internet connectivity of 5MBPS to run the online classes without any interruptions. You will also be provided with IBPS Clerk Pre (10 Mocks) + Mains (10 Mocks) Online Test Series (Validity: 6 Months) and Ace Series Ebooks and Hardcopy books of Maths. The candidates can freely ask their doubts during a separate doubt session and this is why you are required to have headphones/ earphones that have a mike too. The fee that is required to be paid for the batch is Rs. 3399/-.